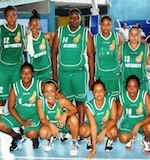 In Saturdays womens final, last years runners-up Mont Fleuri met HotShots who defeated 2013 winners Anse Etoile Stars in the semifinal. HotShots looked a little unsure during the first quarter which ended in Mont Fleuris favour with a score of 11-8, but the players of coach Philip Arissol started stronger in the second and managed to outscore Mont Fleuri. They scored 17 points and Mont Fleuri got 12 to lead 25-23 at half-time. Mont Fleuri started the third quarter with a 3-pointer by Williana Dubois, but the score stayed close as HotShots led 38-36 at the end of 30 minutes of play. With victory on their minds, the HotShots players made sure of committing fewer mistakes and scoring more baskets to win the fourth quarter 12-9 and the game 50-45. HotShots Tina Agathine (C) led all scores with 13 points. HotShots coach Philip Arissol said he is happy with how his players performed although they did not work out their plays as they should. The Curtain-raiser tournament has given me the opportunity to see what I have to work on for the league championship which is to start soon, added coach Arissol. As for his counterpart Tony Juliette he had this to say: Our defence wasnt good. What we worked on in training we did not implement during the game, and we did not perform the plays we worked on. Commenting on Mont Fleuri losing the Curtain-raiser final for a second year in a row, coach Juliette said this tournament is a preparation for the league championship. Im confident Mont Fleuri will do well this season, he added. 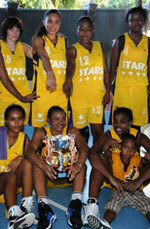 The line-up for the 2013 womens Seychelles Basketball Federation (SBF) Cup final has now been confirmed with Mont Fleuri set to battle league champions Anse Etoile Stars in a repeat of last years final. After the Stars had strolled to the final with victory by walkover against Juniors, Mont Fleuri had to sweat to earn their place in the final. In Tuesdays semifinal, Mont Fleuri met HotShots with both teams looking to join Anse Etoile Stars in the final and perhaps end the north Mah sides dominance in womens basketball this year. The match started disappointingly for Mont Fleuri as they failed to match their opponents and they trailed by six points after the first quarter (4-10). They came out stronger in the second quarter though to win 23-15. This gave Mont Fleuri a slender two-point lead (27-25) at the end of the first half. Mont Fleuri, coached by Tony Juliette, kept the pressure on their opponents in the third quarter to open up an eight-point lead (43-35) going into the final 10-minute spell of the match. In the final quarter, HotShots fought harder to try and change their fate, but Mont Fleuris determination kept them at bay as they again won it 19-15 to close the game at 62-50. HotShots Tina Agathine led all scores with 22 points, while Williana Dubois and Bernadette Songor contributed 14 points apiece for Mont Fleuri. The final will played on Saturday and will be the second time these two meet in a final this year after meeting earlier this year in the Curtain-raiser tournament final. The Stars will be looking to complete a clean sweep of all titles this year, while their opponents will be attempting to claim a piece of silverware. Womens champions Anse Etoile Stars and Premium Cobras collected easy wins at the weekend, while MBU Rockers rebounded from two consecutive losses to PLS Hawks to edge Baya. In the mens division one, Premium Cobras outscored RC Dynamics by 30 points to claim a 79-49 win. Dan Come led the scoring for Cobras with 16 points, Amadou Sylla added 15 and Michael Jean chipped in with 12 as they outscored Dynamics in all four quarters 22-15, 22-12, 21-9 and 14-13. Keneth Domingue led the Dynamics with 16 points. This was Premium Cobras second win in as many matches after edging Angels 66-63 in their first game, while Dynamics suffered a second loss in a row after losing 43-66 to Baya in their first game. Ervin Agathine netted 13 of his game-high 21 points in the final quarter but they werent enough to prevent Drifters from losing 58-73 to Mont Fleuri Dawgz. The Dawgz, who dominated the first three quarters 18-14, 27-14 and 12-9 before losing the fourth 16-21, were led by Sergio Ah-Kong and Steven Andr with 11 points apiece. Anse Boileau-based Drifters have now lost their second game in a row after losing 68-89 to Beau Vallon Heat in their first match. The game between Baya and MBU Rockers was a very tight affair and the Rockers eventually won by a mere two points. The final score was 71-69 as the Rockers celebrated their first win in the league following an 83-91 loss to defending champions PLS Hawks in their first game. Pascal Bibi had the hot hands for the Rockers with 20 points, while Daniel Hoareau scored 16 and playmaker Nigel Sinon added 14. Centre Timmy Adam scored 15 points for Baya who had three other players Dave Roseline, Faizel Naiken and Alex Baron finishing with 10 points each. Meanwhile, in the mens second division, Razors cruised past Wolf 89-48 winning all four quarters in the process, while AAP Brothers lost to Cascade Bullets on a 45-66 score. In the womens league, Simone Malbrook and Magdeline Julienne scored 15 points each to help Anse Etoile Stars earn a 102-29 victory over Juniors. Reigning female player of the year Jana Malbrook added 13 points for defending champions Stars who have already won the Curtain-raiser title this year. The Stars dominated all four quarters 30-6, 21-9, 30-5 and 23-9. The match of the day Sunday though was between HotShots and Mont Fleuri. HotShots battled hard in the final two quarters to outscore the Mont Fleurians 37-33, but their opponents had already done the damage in the first half which they won 38-18 (20-12 and 18-6). The final score was 71-55 in favour of Mont Fleuri who were led in scoring by Lindy Morel and Agnes Bristol with 16 and 14 points respectively. Sheriffa Agathine led HotShots in scoring with a game-high 24 points.